At Whitebeam Chalets, we want you to be as relaxed as possible when you arrive in Peisey-Vallandry and throughout your stay. That’s why we give our visitors as much advice and support as possible when it comes to organising their holidays. While there are other ways to get to us from nearby airports, we guarantee the easiest way, with least hassle, is via private airport transfer. Peisey-Vallandry in the French Alps is part of the Les Arcs ski resort, of which is linked to La Plagne via the famous Vanoise Express. This is known as the Paradiski ski area. Where can you get a Peisey-Vallandry transfer from? As outlined below, Geneva Airport has the best choice of frequent flights to and from UK airports on a daily basis, but you can also get a transfer from Grenoble, Lyon or Chambery. Geneva to Peisey-Vallandry: approximately 165 km (2.5 hrs). Grenoble Airport to Peisey-Vallandry: approximately 200 km (2.5 hrs). Lyon Airport ski transfers to Peisey-Vallandry: approximately 200 km (2.5 hrs). Chambery Airport to Peisey-Vallandry: approximately 140 km (1.5 hrs). Who provides airport transfers to Peisey-Vallandry? We work closely with Whiterides, to organise your transfer to Peisey-Vallandry from any of the four airports. With Whiterides, you can rest assured that you, your family and your friends will be transported safely and comfortably from your airport of choice, which is of utmost importance Whiterides and Whitebeam, hold with utmost importance. 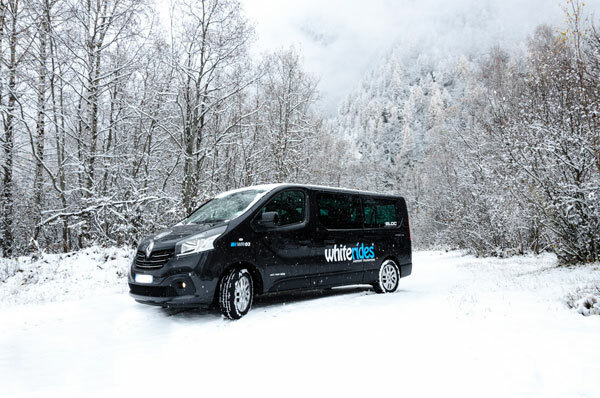 The company is fully licensed and insured, and its minibuses are equipped with winter tyres and snow chains, so you won’t be getting stuck, even in heavy snow! 24/7 service, any time, any day. New, clean and comfortable minibuses. Free child seats for kids of all ages. Experienced, knowledgeable and friendly drivers. An SMS booking reminder the day before you arrive. Owner Dan Barnett was a professional lorry driver in the UK before setting up Whiterides Airport Transfers ten years ago. The company is based in Peisey-Nancroix, where Dan lives with his wife and son. Here’s what he had to say in an interview with Whitebeam Chalets. What bought you to Peisey-Vallandry? I love snowboarding and so I came to Les Arcs in winter 2003 as a ‘seasonaire’. After I completed several seasons as a chalet host, unfortunately not with Whitebeam, I became a transfer driver for another company based here in The Alps. Something I really enjoyed. For many winters I returned. Each summer I would go home to the UK to work as a truck driver, as I hold a Class 1 Haulage licence. Being a keen mountain biker from a young age I soon found amazing singletrack in and around Peisey-Vallandry, which I used when I wasn’t snowboarding. I was hooked, and soon made plans to move here. I love The Alps in both winter and summer. Why would you recommend skiing in Peisey-Vallandry? The skiing in Peisey-Vallandry is suited to all levels of skiers and boarders, so you will find easy green and blue runs, as well as steeper reds and blacks. On a powder day, there are some great spots through the trees that run back down to Peisey-Vallandry village. The lifts take you well above 2,000 metres, where you can then ski all the way down to Peisey-Vallandry, or you can choose to head over to Les Arcs and the rest of the resort. Why would you recommend a private transfer to Peisey Vallandry? Even if we are a little biased, private transfer is definitely the easiest way to get to resort! No changing transport, no lugging suitcases around. You don’t even have to worry about the driving. With Whiterides, you’ll be greeted by your driver at the airport when you arrive and head off to resort as soon as you’re ready to go. You sit back, relax whilst your driver takes you all the way to Peisey-Vallandry (we do airport transfers to many other resorts too). There’s no waiting for other people, the transfer will be for your group only, and no stopping en route (unless you want to, of course). When you arrive in Peisey village or Peisey Nancroix, you’ll be taken directly to Whitebeam Chalets and dropped as close as possible to the front door. What could be easier than that? Which airport would you recommend flying into for a ski holiday in Peisey Vallandry? We would recommend flying to Geneva, for holidays in Peisey. You’ll find the widest range of flights from the UK, at a sensible time of day. Driving time from Geneva to Peisey-Vallandry is approximately two-and-a-half hours. The transfer route is picturesque – we go through the town of Annecy, along the shores of the Lake, then on to Albertville. From here, it’s a 45-minute drive up the mountains. Thanks to Dan at Whiterides airport transfers for this information. For a peaceful and safe trip to Peisey, Whitebeam Chalets really do recommend a private transfer. We love our guests to arrive relaxed and happy. Snowy mountain days are when our guests especially appreciate a professional driver, that is fully prepared with snow chains. If you would like to check out other ways to get here, just look at our travel pages, we have information on travelling by train, bus or car as well. Find out more about Whiterides Airport Transfers on their website.